Little Hanger, is the old coach house which has been converted into beautiful holiday accommodation. Stunning sea views. Sleeps 6 in two double bedrooms and a twin. 5 minute walk to the village with pubs and shops. Walking, cycling or relaxing. The self-catering apartment, Little Hanger, has been converted from the original coach house and stables of Hartshanger, an Edwardian villa set above the village of Porlock in the heart of the Exmoor National Park . We have two self-catering apartments and have lived here since 1996 with our dog called Rufus and the occasional deer and badger. 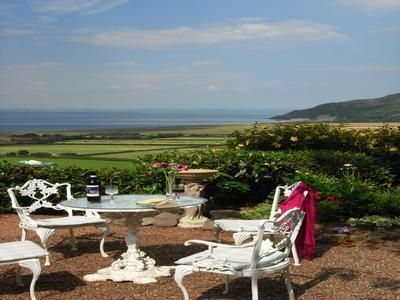 The house is situated within grounds of about 5 acres with lovely views over Porlock Bay towards Wales. In the spring and summer the mostly wooded hillside is ablaze with colour from bluebells, azaleas, camellias, rhododendrons, hydrangeas, primroses and wild cyclamen. It is a peaceful place, with the only sounds being that of bird song, the surf on the beach below and the occasional call from a seagull, buzzard or sheep. It is the ideal place for those wanting to get away from it all and relax. Perfect for a romantic getaway. We have an all-weather tennis court for the more energetic to use. We have racquets and balls for you to borrow so no excuses on that score! Little Hanger sleeps up to six guests in two double rooms and a twin room. The main double bedroom has sea views and an en-suite with power shower and the second one has a patio door to a juliette balcony. In the twin room, one bed can be removed to accommodate the cot. The main bathroom has a bath with an electric shower over it. There is a large walk in airing cupboard with hanging space to dry coats etc. The kitchen is fully fitted for at least six with a full sized electric oven and hob, dishwasher, fridge and microwave. The kitchen opens on to the dining area and sitting room where there is a log burner, logs provided FOC. Patio door leads out to a small private garden with table and chairs and a barbeque area. From here you can enter the rest of the grounds and it is a short walk to the tennis court. The old tack room, under Little Hanger, off the stable yard, has a washing machine and a tumble drier; airer to dry clothes; freezer; space to store your bikes or pushchair etc. Outside you will find a tap with short hose to wash the mud off your bicycles or dog. This laundry/store room is shared with High Hanger our other self-catering apartment. Porlock is a living village 12 months of the year. There are two churches, C of E and Methodist and a medical practice. As for shops, we boast two small supermarkets, a butcher, cheese shop, pharmacy, hardware store, Post Office, two art galleries, antique shop, pet shop and ladies clothes, garage and numerous gift and sweet shops. For those who do not wish to cook there are at least ten places to eat, from breakfast to dinner in two pubs, various restaurants, tea rooms and hotels - at prices to suit all pockets. Porlock, situated “twixt moor and sea” is the ideal base for exploring the beautiful Exmoor National Park whether by foot, bike or car. Exmoor has something to offer everyone, from wild animals and birds, spectacular views, archaeology and vernacular architecture to steam trains, walks, rural museums and National Trust properties. All are within easy reach of Porlock. There is ample space for parking cars and it is safe as we are well off the road. Located on edge of the village of Porlock with stunning views across the Bristol Channel towards Wales. Porlock is in Exmoor National Park, surrounded by gorgeous countryside and close to the quaint National Trust villages, Selworthy and Bossington. Contact Alanna Edward for Enquiries and Availability.